Marton and Layton Hawes, Blackpool. Inland from Common Edge Lane lay Marton Moss which over the centuries had been drained and cultivated. For centuries, the land between Common Edge Lane and the sea was a vast expanse of common land known as Layton Hawes. It was poor pasture land because large sand dunes had smothered the coastal stretch and the rest was overblown by sand; the area known as Blowing Sands is over a mile from the coast. From the 1760s, Layton Hawes was drained, fenced and long, straight lanes were constructed. The land was sold or leased to farmers and new farmhouses and workers cottages were built. By the 1860s, along the coast, the South Shore area of Blackpool was evolving and over the next hundred years the lanes, fields and farms gave way to streets, houses and shops. 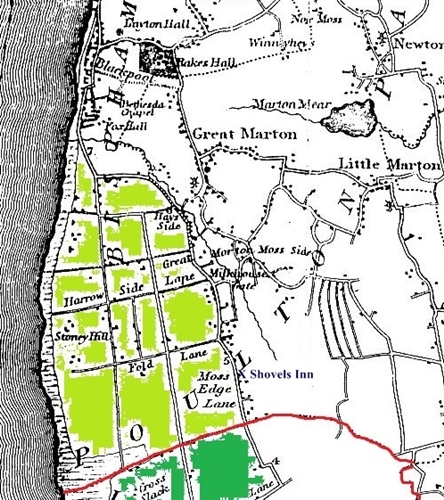 Blackpool c1830 - the area shaded light green was Layton Hawes which was open common until it was enclosed from the 1760s onwards. The area today comprises all of South Shore and part of Central Blackpool including St.Annes Road and Lytham Road (the two long lanes running north-south). Common Edge Lane runs along the right hand side with Marton Moss inland. Along the coast is a belt of sand dunes which stretched from what is now Manchester Square, southwards, as far as Lytham and the River Ribble.